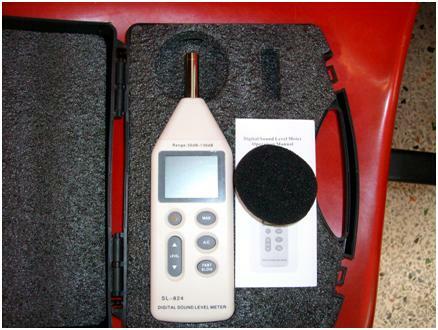 SL-824 is a digital multi-function Sound Level Meter designed to measure sound pressure level and are commonly used in noise pollution studies for the quantification of almost any noise, but especially for industrial and environmental. The device meets the measurement requirements of Safety Engineers, Health, Industrial Safety Offices and Sound Quality control in various environment. It features Bar-graph Indicating & Max Value Holding, built-in condenser mic and digital display. It accurately measures the sound level of just about anything from sound of level of environment to mechanic, vehicle, ship, loudness of computer fans and other noise with ±1.5 dB accuracy. It has the following advantages: 30~130dB range, with A/C weighting, fast/slow response, equipped with Max mode that captures and hold the maximum noise level, provides a windscreen for filter-out unwanted signals and a 9V battery with no extra charge. In almost all countries, the use of A-frequency-weighting is mandated to be used for the protection of workers against noise-induced deafness and the only weighting mandated by the international standard, the frequency weightings 'C' being optional fitments. SL-824 is accredited by American National Standards Institute (ANSI) and the U.S. National Committee, the International Electrotechnical Commission (IEC) signifies that the device meets and comply with all the essential requirements of American National Standards. This handy, portable, lightweight and easy to use measuring instrument fits for industry, environmental protection, working, sanitation, teaching research and other departments. Continuous high pressure levels can permanently damage the hearing capacity and even audio speakers. SL-824 with all its useful features helps us achieve and maintain a healthy environment. It so simple to operate, ANYONE can use it! ๑ AC and DC signed output for frequency analyzer level recorder, FFT analyzer, graphic recorder etc. - AC output: 0.707 Vrms at FS output impedance approx 600 ? - DC output: 10 mV / dB output impedance approx 100 ? Handle the SL-824 meter with care, it is sturdy but don't forget it's also a precision device.